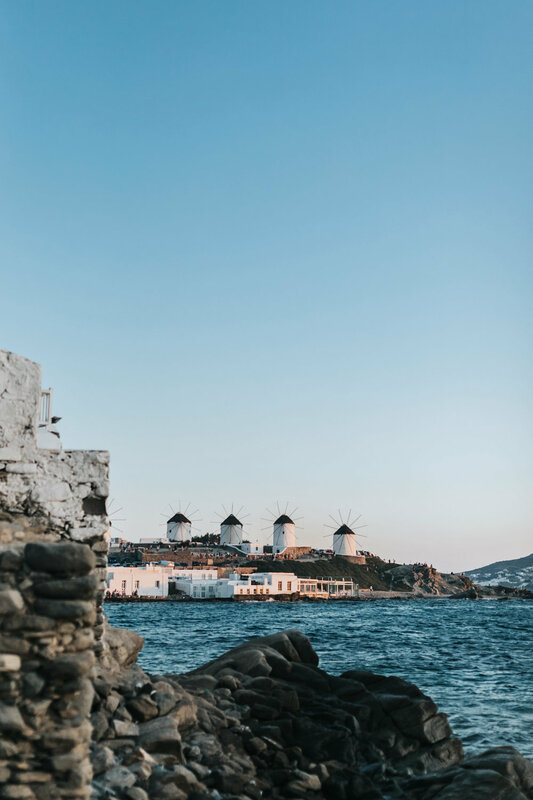 Mykonos is such a beautiful island, there is so much to do, and I could have spent months there! It is known as the "party island" and there is certainly a ton of beach clubs and bars available if that is what you are looking for, but there are also so many places to relax and get away from it all, as well as places to shop and eat and just wander. It has something for everyone, which was a surprise to me, and I already can't wait to go back! We spent an entire day & night at the amazing Scorpio's Beach Club - It has a sort of Mad Max vibe to it, and such fun interior design. You can book a beach bed, hang out in their many "chill" spots (with hammocks and pillows and everything you could want, including a sea view) and in the evening the restaurant opens and it is delicious! They had live music while we were there, and the party just continues into the night on the beach with a bonfire & music. So fun! We also so enjoyed wandering the streets of the island - The great thing about the fact that the island is a party place is that so many restaurants and shops are open super late if not 24/7, so there is an endless amount of things to do.